UpdateFixed the dust dots to make them blend with the BG instead of just plain white. OK I've always wanted to do a wallpaper of Gilgamesh but sadly there's not a scan that interest me until I saw Fiifo's MAL profile picture which urged me to wall one. The original scan is from a screenshot of the Ending song of Fate/Zero Season 1. What is different in this wallpaper is that I used SAI. It's my first time using it. It's like 85% done in SAI and 15% done in PS. So it is mostly painted. Why? because I really thought this Ancient King would really look good in painting just like those of Tsunoh's rather than vectoring. So off I go and study SAI and painting techniques. I also used multilayering for the painting to give it a rough edgy feel. Next comes the BG. Actually I was planning to do a pyramid-ish/ heiroglypic wall of text. I tried it but it didn't look good since the chair is oriented at a angle, and by placing a wall, the perspective will look wrong even if I added depth. So what I did was o paint randomly. SO they are not clouds nor is it a sky but some random painting here and there. I added smoke effect and dust dots to make it rough + texture. Actually SAI brushes have these awesome texture effect brushes which really piqued my interest. Overall, I like this roughly painted so meaning it's not too detailed. Not every edge should have a specific curve or not every stroke should be straight. It may not be as detailed as other painted walls out there but hey, I did one and that's what matters. So what's next? I think I'll be on walling Hiatus except for collabs coz I'll be doing some manga stuffs as well as marathon a few anime and manga. WIP can be found below. PS: It's not a video because my laptop can't support Camtasia to record why Many programs are opened at the same time. Reason: 8 year old laptop with 1 GB RAM only. So bear with screenshots. Nice wallie srsn, faves it. is that stars shape ? The skin is AMAZING Ash! Kudos for that! Two things though: I think you might have overdone the dust dots, it looks like there are way too many of them and they are pretty bright too, which makes the wall just a bit cluttered. Maybe lower their oppacity? And the outlines of the eyelashes might be too black, the contrast between them and the predominant colour palette is rather striking. I wished it was a darker shade of brown instead. But then again, that's just me. Aside that, this is so beautiful Ash. Well done! I also think you've managed to develop your own thing even though you mentioned Tsu as inspiration - Tsu's style is more messy and relies on sharp and sketchy brush strokes, yours are more defined. 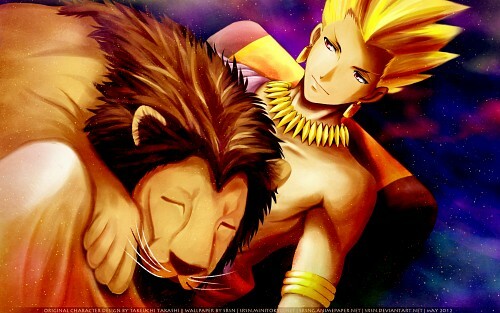 The skin really does look awesome and I love that sleeping lion on his lap, lol. As Fran said, the amount of specks is a bit too much; maybe you could erase some of them or better yet - make them more yellow/golden to blend in more with the color warm colors of the guy. I'd also add some bluish/purple tones/shading to his skin and hair in places where they are the darkest and meet the blue background (right side of his arm and face) to better blend in with the blue lighting of the right side. You did a great job with all the detail work with SAI and i think the specks are abit over the top but doesn't draw away how awesome Gilgamesh looks!